Chinese restaurants typically turn out a high volume of dishes in a noticeably short time. The secret is stir-frying, a speedy cooking method that tosses bite-sized pieces of meat and vegetables in hot oil over a wok or skillet. You can use the same technique at home to replicate Chinese takeout or get a work-night dinner on the table in a hurry! Prepared oyster sauce, available at most grocery stores, adds the essence of oysters to this dish. 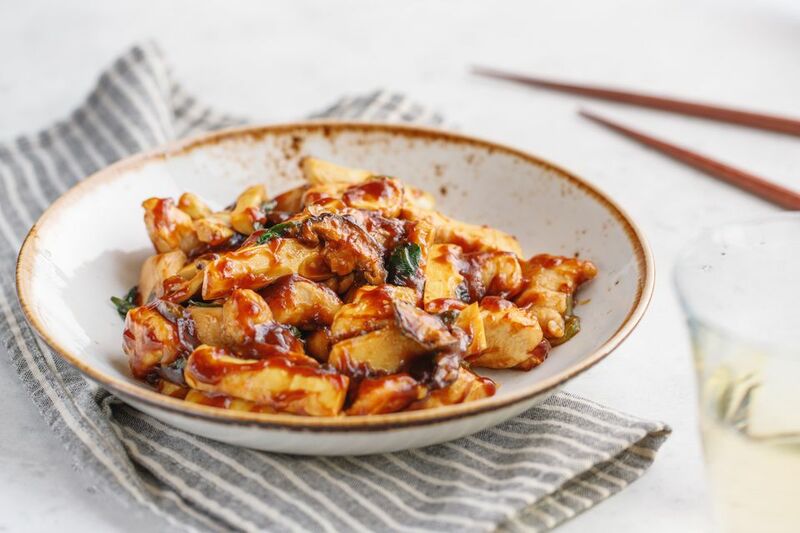 The finished flavor of a dish served with oyster sauce—combined with all of the other ingredients—becomes more savory than fishy. Combine the first three marinade ingredients in a large bowl. Add the chicken and toss to coat; sprinkle the cornstarch evenly across the meat and toss again. Marinate the chicken in the refrigerator for 10 to 15 minutes. While the chicken marinates, dissolve the cornstarch in the water, then mix it with all of the other sauce ingredients in a clean bowl. Heat a wok or deep heavy skillet on high and add 1 tablespoon canola oil. When the oil shimmers, add the garlic, ginger, and green onion, then stir-fry for about 1 minute or until fragrant and just starting to brown. Remove the aromatics with a slotted spoon. Add the chicken and stir-fry, stirring frequently, until the chicken changes color, about 3 to 4 minutes. Remove the chicken from the wok and discard the unused marinade. Add the remaining oil, return the garlic, ginger, and green onion to the wok, and stir-fry the mushrooms and bamboo shoots or baby corn for 1 minute. Make a well in the middle and add the sauce, giving it a quick re-stir before combining it with the chicken and vegetables. Stir-fry for an additional 1 to 2 minutes, or until the sauce thickens and coats all of the ingredients. Try not to add too many things to the wok all at once. If you add too many items at one time, it will cool down your wok and your food will simmer or steam rather than fry. One of the tricks to stir-frying is to cook the ingredients in batches.